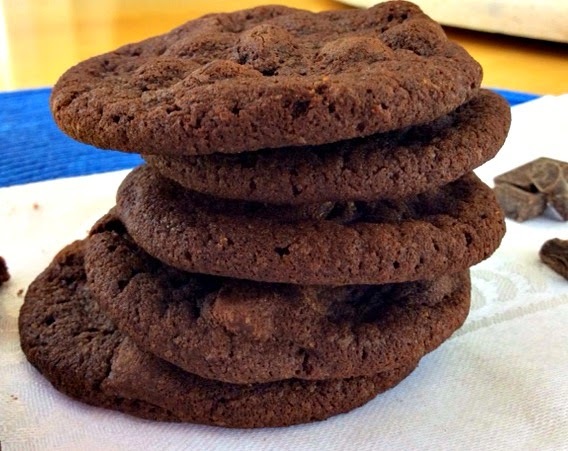 Deep, dark and rich, these "Double Chocolate Chunk Paleo Cookies" are for true chocolate lovers! Crisp and light on the outside, chewy gooey on the inside- yum! Definitely the best gluten free chocolate cookies I have ever made and so quick and easy to make. You will find yourself making this recipe over and over again as they will not last very long in your house. Consider making a double batch like I do! 2/3 cup dark chocolate chunks Note: Enjoy Life brand chocolate chunks and chips are gluten, soy and dairy free. Preheat oven to 350 degrees F. Using a standup mixer, mix together coconut oil and coconut palm sugar. Add the vanilla, coconut flour and cocoa powder; mixing until combined well. Add baking soda and salt; continuing to mix. Line a baking sheet with parchment paper. Drop the cookies by spoonfuls onto the cookie sheet leaving at least 2 inches between each as these cookies will spread out very thin and almost double in size. A good trick to keeping these cookies nice and crispy (because coconut flour based cookies tend to soften quickly) is to put the cooled cookies in the freezer. When you are ready to eat them pull them out and enjoy immediately. The frozen cookie will be crispy and not hard. looks really good! I have pinned these to try! Thanks for sharing it! ps, featuring them this week! Thank you Tessa! And thanks so much for hosting AFW! Best and enjoy the weekend! What wonderful cookies - I love how rich and chocolatey they are! Thank you for sharing them with us at the Hearth and Soul Hop Linky party. I'll be featuring them at next week's party :-) Pinning too! I'm so glad you enjoy the party as much as Swathi and I do, Phyllis. Thank you for being a part of the Hearth and Soul community! Hi what can I use instead of the eggs? I am allergic to eggs so cannot use them. Would love to make these with a substitute though..
You can try using Ener-G egg replacer in this recipe (follow the package directions) although I have not tried using it with this particular recipe. Another option is to use 1/3 cup of applesauce or coconut milk yogurt instead of the eggs. Hope this helps. Thanks for stopping by and have a great day!